I believe that Apple created the iPad, at least initially, to be a content consumption device. It’s fabulous for reading magazines, watching video and playing games. However, when it comes to actually being productive, I found the onscreen keyboard practical only for short-form content like tweeting to friends, updating my Facebook status and short replies to emails. 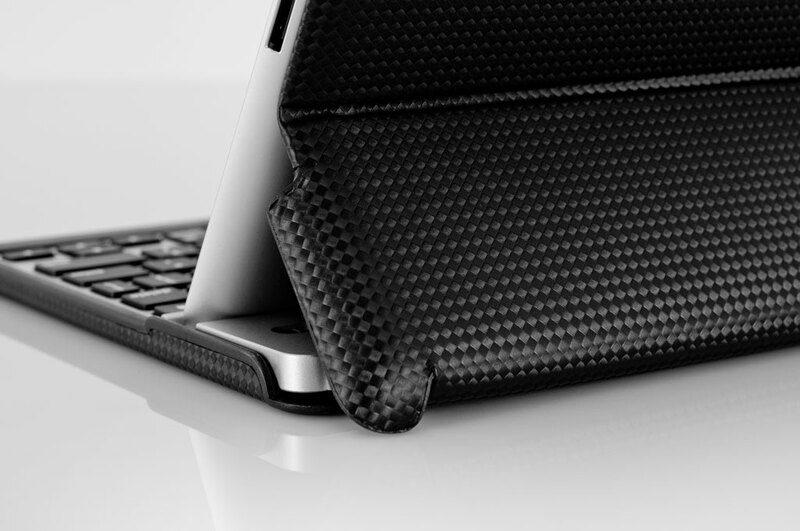 Enter the ZAGGfolio Keyboard Case, a device that tackles these issues with ease. This $99 bluetooth keyboard case changed the way I use my iPad. When I got my first iPad, I also purchased the Apple keyboard dock. Unfortunately the vertical orientation was the wrong orientation for most of the apps I use. It also wasn’t compatible with any of my cases and on top of that, the keyboard dock is bulky and weighs more than the iPad itself! Not exactly portable. I switched to an old flip-out keyboard that came with my Dell Axim handheld computer but it didn’t have Apple specific keys and the tiny form-factor made typing a bit of a pain. When offered a ZAGGfolio from ZAGG to review, I was ecstatic. For years I looked for a solution to the problems highlighted above. There are several keyboard case options on the market but most left me disappointed. Many of the popular keyboard cases use rubber keyboards that are squishy, clunky and slow. I’ve tried half a dozen of these (mostly at airport kiosks) and they all performed exactly the same, worthless. ZAGG has seven polyurethane case colors (carbon fiber, blue, red, green, pink, orange and purple) and three leather colors (brown, black, alligator). Inside the case slides your iPad 1, 2 or 3 aka “new iPad” and a keyboard that is either silver + black keys, black + black keys or white + white keys. I chose the carbon fiber (not real carbon fiber unfortunately) and silver + black keys. From first glance I thought it was actually an aluminum keyboard enclosure, alas it is plastic. I suppose this keeps prices down and the case as light as possible. There really isn’t anything to say about the look and feel of the case except that it’s great. Folded down, it’s just a hair under an inch thick, though it tapers off a bit. You simply slide your iPad into the case, as you would with any cover, and when you want to use the keyboard, simply unfold the iPad into the keyboard’s iPad slot. The keyboard must be slid out to charge via USB about twice a year, or if you want to change the iPad’s orientation. 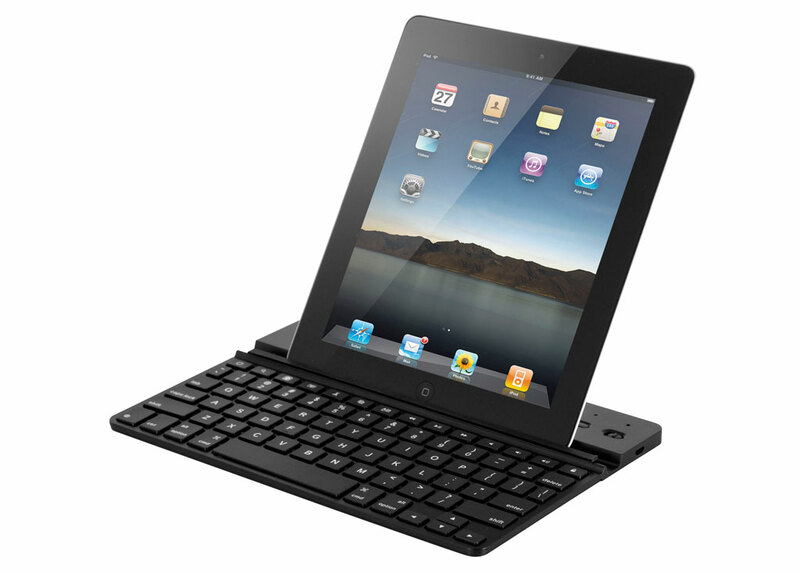 Unlike most iPad keyboard cases, the ZAGGfolio allows you to prop the iPad up in both portrait or landscape mode. Just slide the iPad out of the case and put back into the slot vertically. 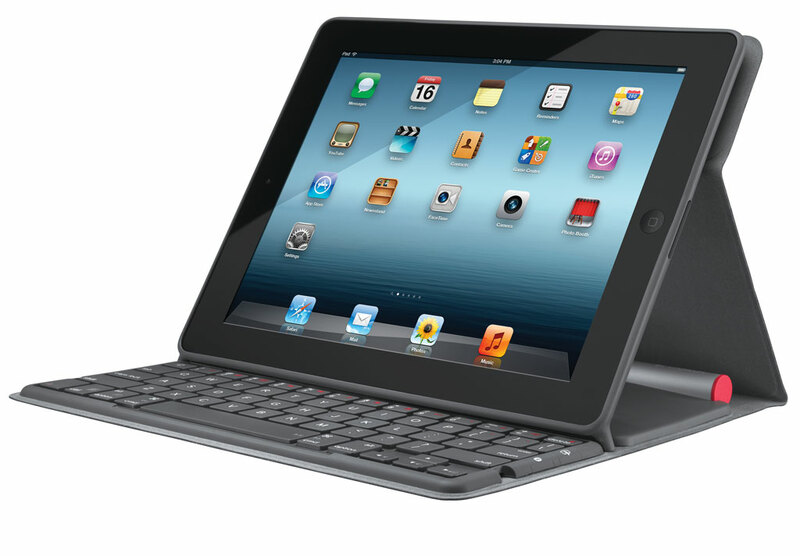 If you upgrade from an iPad 1 or 2 to the new iPad, keep your old ZAGGfolio keyboard and simply order just the new case. This is awesome. I only have two gripes with the design of the ZAGGfolio. The lock/mute toggle can be hard to switch when in the case and it only allows one angle during operation. This 60 degree angle is not the end of the world but on an airplane 60 is a bit steep, however watching a movie while in bed, the 60 is a bit shallow. I suppose though it is the happy-medium between 45 and 90 degree angles. Typing on the ZAGGfolio is heavenly. Unlike the flip-out keyboard I was using which was about 60% the size of a full size keyboard, the ZAGGfolio allows me to type comfortably for extended periods of time, though it isn’t quite a full-sized keyboard. The time from turning on the bluetooth to actually being able to type is under two seconds so no complaints there, and I haven’t had any issues with it missing a key-press. It actually feels a lot like a clickier version of the Apple keyboard. Compared to the iPad onscreen keyboard, I was able to type a full 40 words per minute faster with 5% greater accuracy. That’s pretty darn impressive if you ask me. Not quite as good as the full-sized Apple keyboard where I got 85 words per minute but I’ll take it! My ZAGGfolio was used religiously for all of April and into May. Anyone who saw it wanted to use it. One person on a flight from San Francisco to Des Moines actually took the iPad off my tray-table to inspect it (without even asking…). He was amazed at the seamless experience and decided on the spot that he was going to buy one for himself and his wife. I can’t tell you how many people have said they wanted to get one since watching me using mine. It became a topic of conversation on nearly every flight I went on and allowed me to travel without my laptop, taking several pounds out of my carryon bag. Plus it looks fabulous in black leather. I say “used” for a sad reason. While preparing for our Cinco de Mayo party, about half a cup of horchata (sugary rice milk) sprayed across the ZAGGfolio. I tried desperately to soak all the sticky liquid out of the keyboard but apparently I didn’t get it all. While the device works all the same (amazingly) many of the keys suffer from the sticky residue. Luckily I can always replace just the keyboard portion saving $30. Still, that the electronic components could even survive such a sticky and wet situation is a testament to the quality of the ZAGGfolio, even if they don’t feel as expensive as an aluminum keyboard might. 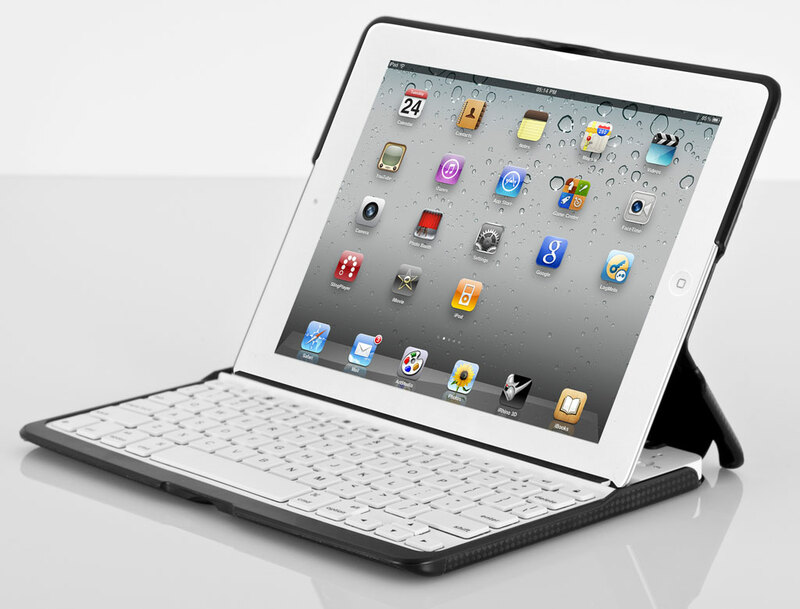 If you are in the market for a keyboard case for any generation of iPad, I highly recommend the ZAGGfolio. Just keep your horchata at arm’s length. An upside to the horchata disaster is that it gives me an excuse to try out one of the new Logitech iPad keyboard cases. They just announced two new ones that pique my interest. I’d like to thank the great people at ZAGG for giving me a chance to review yet another of their products. Hard to believe this great relationship started from a negative review I wrote on their ZAGGsmartbuds headphones. I recently gave those headphones to a friend who loves them. Perhaps they just weren’t meant for me. 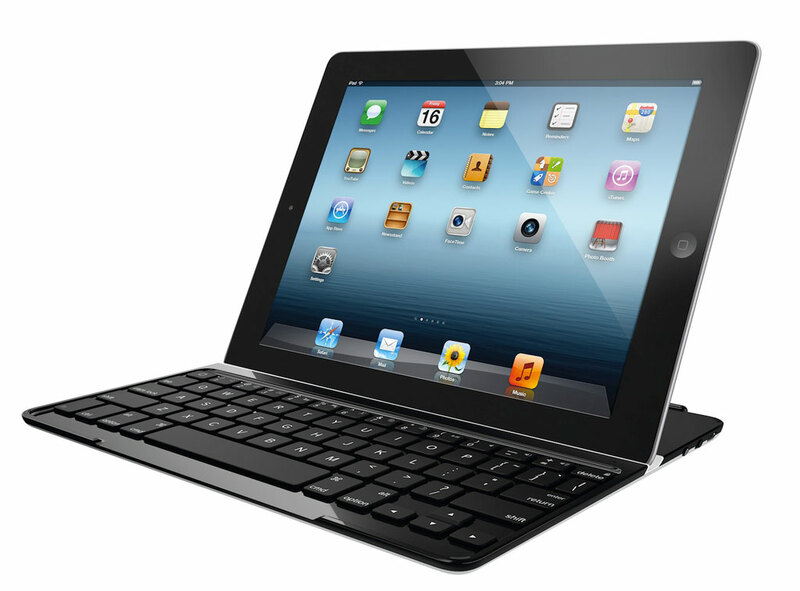 This entry was posted in Accessories, Gadgets, Nerdiness, Review, Thoughts and tagged Apple, best bluetooth keyboard, best iPad case, Bluetooth, Dell Axim, Facebook, iPad, iPad accessories, iPad case, iPad keyboard, iPad keyboard case, Logitech tablet keyboard, USB, Zagg, ZAGGfolio by Justin Scott. Bookmark the permalink. There is a new company launching on November 5th called domeoproducts.com. 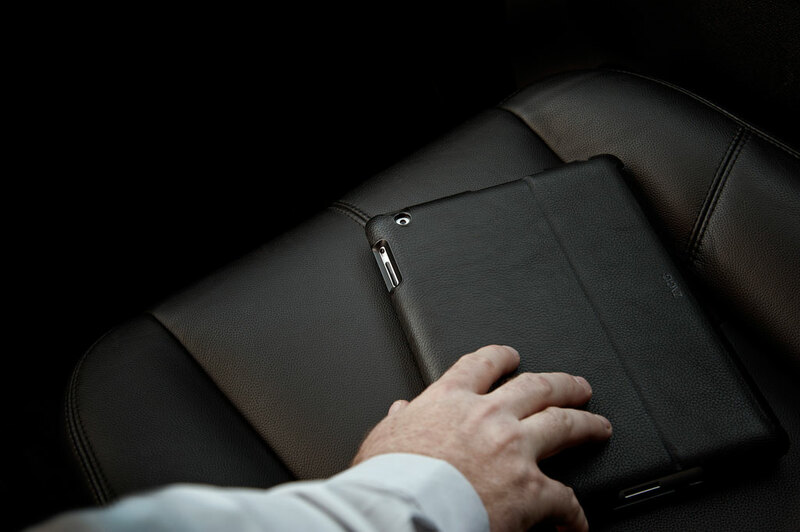 They are a company that makes iPad and iPad mini cases. I have seen a couple of pictures of them online, and they look awesome, but I was wondering what you guys thought about them? I need a new iPad case, and I was thinking about getting one of them. Thanks! This sounds like a great case! I am looking to get a new iPad case, and I heard of a new company called Domeo Products that will be launching on November 19. It looks like they are going to have some great iPad cases, but I was wondering if you have heard of them? I am looking forward to checking out their products at http://www.domeoproducts.com.